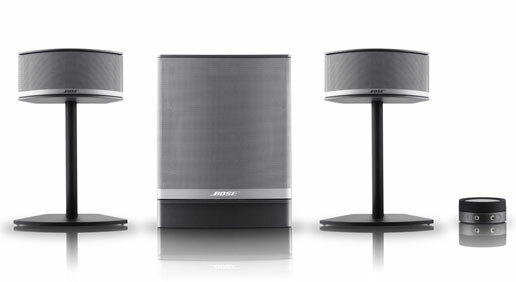 With a Bose®multimedia speaker system, you can turn your computer into a home entertainment centre. 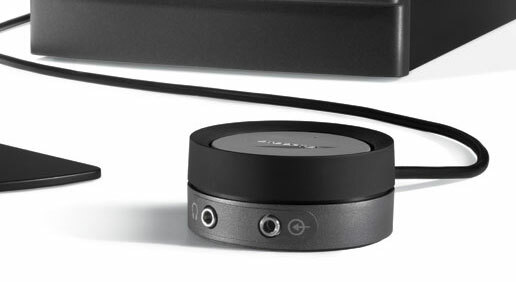 Bose® proprietary technologies give you astonishingly full sound and natural performance. 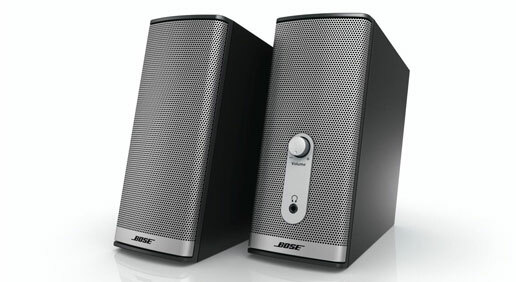 The most affordable computer speaker system that puts familiar, high-quality Bose® sound within your grasp, Companion® 2 multimedia speakers offers a ported cabinet design that delivers richer, more satisfying music and big, defined movie and gaming sound effects from within a small enclosure. Monitor interference and damage to magnetic media are avoided with magnetically-shielded speaker elements. With the Companion® 2 system, you’ll experience a spacious, dual-channel soundstage thanks to exclusive TrueSpace® stereo digital processing circuitry, perceptually extending past the speakers themselves. Sit at your computer and feel the full extent of the speakers’ proprietary sound reproduction, feeling the presence of enhanced lower frequencies than with comparable computer sound systems. With automatic tonal balance, true-to-life sonic output is possible almost all listening volumes. Enjoy maximum audio scope and definition for all your music, movies and games. 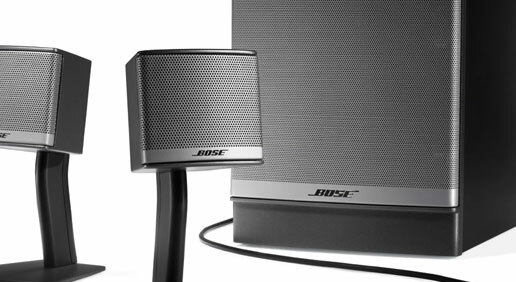 With a sleek, current appearance, the Bose® Companion® 2 speakers add a compelling visual accent to any desktop or PC setup. You’ll easily be able to connect a pair of headphones or adjust volume levels thanks to convenient, easily-accessible control and headphone jack placement. Enjoy two simultaneous audio sources with convenient dual inputs, making it a breeze to connect your computer and MP3 player or other portable audio player. 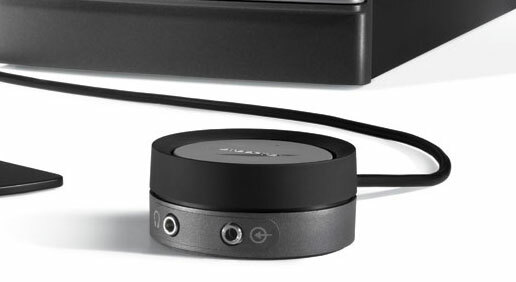 Simply attach the input cable and power cord, and be ready to play back high-grade audio over the Companion® 2 speakers, a multimedia sound solution that lets you hear more of what your computer can give. 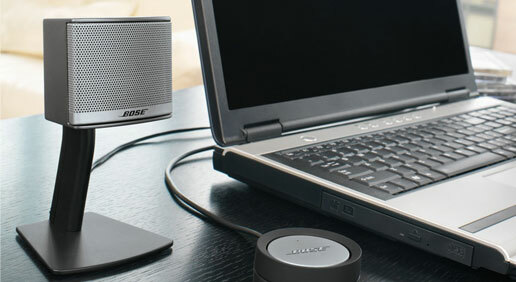 Enjoy superior stereo sound with Bose® Companion® 3 multimedia speakers, augmenting all your computer entertainment. Music, games and movies achieve greater bass depth and high-frequency clarity, whether played from a disc, in MP3 format or from online sources. 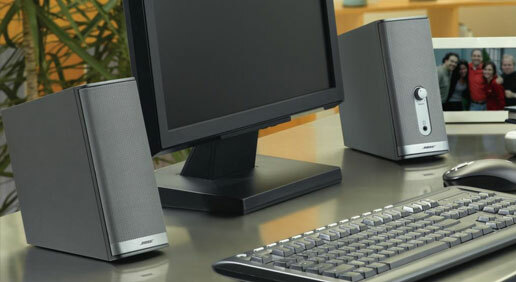 Comprised of two stand-mounted desktop speakers and a discreet Acoustimass® module, this computer audio system unites sonic excellence and economical design. Vocals achieve a clear, natural quality and instruments attain additional body and definition via the two small stereo speakers. This lifelike audio is maintained at almost all volume levels, while compression circuitry upholds clarity and distortion elimination at higher volumes. On custom-designed stands, the Companion® 3 speakers deliver maximum clarity whilst not impinging on space, the perfect design for discerning listeners who need a two-piece design. Magnetically shielded, they guard against monitor interference or damage to magnetic media. Experience truly satisfying low notes and fuller bass response with the compact Acoustimass® module. 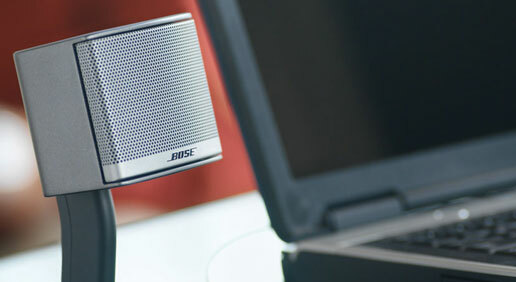 Large in sound, it’s small enough to tuck inconspicuously under your desk without compromising on performance. Completing the system’s capabilities, TrueSpace® stereo signal processing circuitry gives your audio additional space and enhanced atmosphere unmatched by regular PC speaker systems. The Companion® 3 includes a control pod that is both multi-functional and easy-to-use, in a form that’s as small as a computer mouse. Easily reach speaker volume controls, one-touch mute, the headphone jack and an auxiliary input for unparalleled convenience. With dual inputs, you’ll be able to simultaneously take advantage of two audio sources, from your computer and another portable audio device. 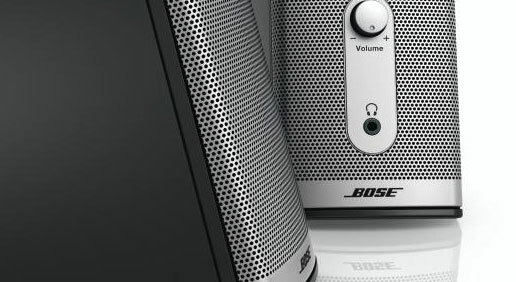 If your computer is your main entertainment centre, the Bose® Companion® 3 multimedia speakers provide the sonic uplift you’ve been waiting for. 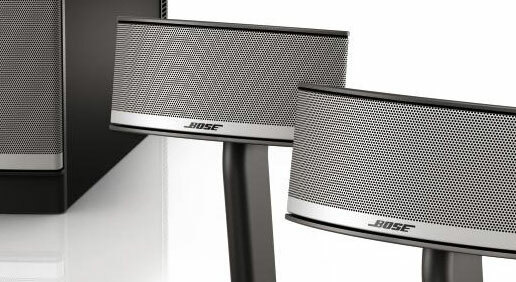 The best-in-class Bose® Companion® 5 computer speaker system has been made to get the best out of your games, movies and music with its superior surround capabilities. Suited to laptop or PC sound sources, this downsized surround sound system makes sure you don’t miss out on any of the fun. Feel the audio immersing you as exclusive TrueSpace® surround digital processing circuitry spreads the audio to make it feel as if it’s audible from all angles. Purpose-designed for computer audio sources, it puts you directly into the heart of your favourite song, game or movie special effects. 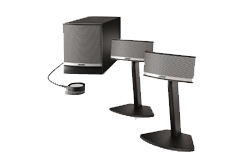 Experience glorious multichannel sound from a three-piece system that eliminates the clutter five speakers impose. 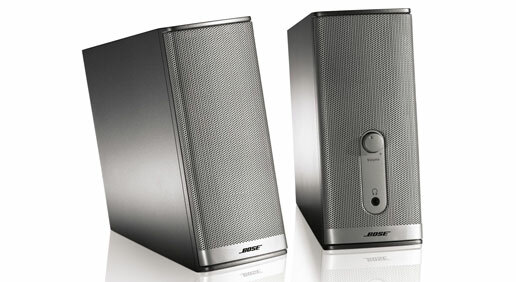 Intended for 5.1-encoded sound from music, games and movies, the Bose® Companion® 5 speaker system is comprised of a mere two smart desktop speakers and a hideaway Acoustimass® module. What’s more, TrueSpace® processing has been crafted just for computer speakers to lend a striking aural atmosphere for gaming, DVDs and your favourite songs. Ready-assembled on stands, the Companion® 5 speaker arrays have been purpose-designed for the best possible performance and to give you more usable desktop space. Bass tones are rendered with the utmost clarity by the small-sized Acoustimass® module, meaning that the desktop speakers can be designed very small without affecting their output. Hide the bass module nearly and discreetly under your desk for an economical setup without compromise. Easily access the volume control, single-touch mute, headphone jack and secondary audio device connection with the clever control pod. Use one USB cord to effortlessly attach a separate audio source such as an MP3 player or tablet to your computer. 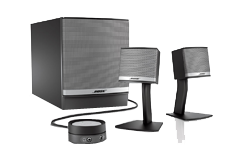 You won’t need any additional software, a sound card upgrade, adapters or troublesome wiring to enjoy the benefits the Bose® Companion® 5 multimedia speaker system. 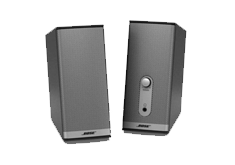 Only a Bose product purchased directly from Bose or from an authorised Bose dealer is with certainty a genuine Bose product.